Discovering that a parent has a hoarding disorder can be very troubling. An adult child may be shocked when they see how much “stuff” an elderly parent has accumulated over the years. Newspapers and magazines are everywhere. Each nook and cranny of the seniors home is filled with stuff from the past. Old clothes are tossed about and no longer being worn. Elderly adults have the propensity to cling to things. These things may end up as a mass of clutter. They have a hard time letting go of things for various reasons. The reasons may range from fear of loss, anxiety, depression, to simply not knowing how to dispose the old stuff. They may also have some attached memories to items which to other people may no longer have any value, like old medicine bottles. Researchers at Johns Hopkins University report that a study shows that the presence of hoarding behavior is greater among older adults than the younger study participants. It was estimated that 4 percent of the general population has hoarding behavior. But, for people aged 55 and older, the percentage is 6.2. 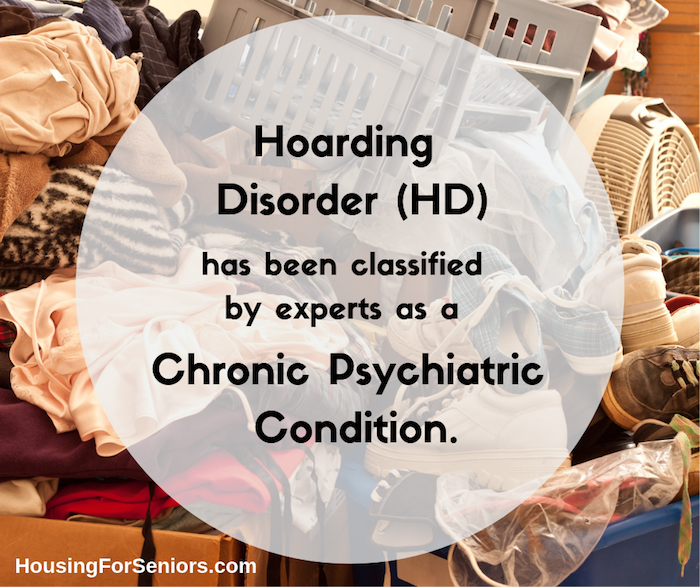 Hoarding disorder (HD) has been classified by experts to be a chronic psychiatric condition. It is characterized by persistent difficulty getting rid or letting go of possessions. People afflicted with this condition find themselves feeling too much distress about the idea of discarding items. They have this extreme urge to save everything, even trash. People with hoarding disorder find it hard to decide which items are worth keeping and what needs to be thrown away. These difficulties lead a person to accumulate too many different kinds of items. Most of these things are supposed to be thrown away. There is such distress that comes with throwing away any item that some seniors keep everything filling not just the cellar or den, but the entire house as well. If left unabated for years, hoarders make their own homes literally uninhabitable. Hoarding is a common issue among the older population. This condition has serious impacts among the senior, family members and the community. Seniors who are living alone can be at risk of hoarding behavior. The same is true to the elderly who is living in isolation. Seniors who are diagnosed with dementia, depression and other personality disorders are also at risk of developing hoarding disorder. Clutter is all over the place. A senior who has HD is reluctant to throw away items that do not have value. Things that don’t seem to have any financial or practical value are still worth keeping for seniors with HD. You will find it too difficult to reach the bathroom or toilet. This is because the pathway leading there is already cluttered. You have to walk really slowly to avoid tripping on any object. If your senior has trouble organizing things, help him do it. But, if he refuses to have them organized and insists it must be left that way, then it should serve as a warning. Closets, kitchen cupboards, basements and attics have disorganized things. Homes of people with hoarding disorder will mostly have rooms filled with junk. But, some seniors are really good at hiding their hoarding behavior. The den and cellars have become unusable. Opening the door to each room can be difficult because there’s too much stuff inside. They excessively save anything to the point of drowning in their own clutter. One sign of an elderly having a hoarding disorder is that his furniture in the house cannot be used anymore. This is because it is already filled with so much stuff. If you find it impossible to sit on your elderly parent’s chair or sofa, be alarmed. Kitchen counters and tables can also be filled with items. This is a sign that hoarding has reached a different level now. Dirt and stench are everywhere. A little dirt and stench can be normal especially if the senior has become too sick to clean his own place. But, if dirt and stench are caused by years of accumulated trash, then it’s a different story. The kitchen, toilet and almost every area of the house does not smell good. The refrigerator is also filled with expired and spoiled foods. These are signs that the senior is not acknowledging the presence of a problem. Living with too many animals. Some seniors might tend to adopt more pets than what they are truly capable of taking care. Animal feces and food wastes are adding to the foul smelling and dirt inside the house. Unpaid bills and lost documents. Another sign of hoarding behavior is unpaid bills. The clutter and lack of organization at home makes it hard for seniors to see bills or any documents that warrant their attention. They have amassed too many letters over the years. This is why finding the most recent one is like looking for a needle in a haystack. Excessive collecting of items that have no value. Hoarding is much like a person who loves collecting items – but is taken to the extreme. Thus, collections may range from restaurant napkins, empty water bottles, flower vases, etc. Others love to collect coupons but never had the chance to use them all. No Visitors are Allowed Inside. Some seniors who are good at hiding their skeletons in the closet would firmly say no to visitors. If their children wanted to see them, they prefer to meet up somewhere else. They don’t want others to know that they are hoarding tons of items and filling their house with it. In most cases, a hoarding behavior can be a huge elephant in the room. We know the stuff is there, but no one is paying attention to it. The key here is to acknowledge that there is a problem. Failure to acknowledge the existence of a problem may end up with negative impacts to the senior’s mental health. There are seniors who are slow in recognizing the hoarding problem. The disorganization tends to push seniors to lose the important items, while they keep the unimportant ones. In turn, serious problems tend to creep up. Living with old stuff may attract mold and mildew which may cause several health problems. Clutter can also impact family relationships. Adult children may become anxious about the thought of having such a big mess as an inheritance. A home extremely crammed with different items increase a senior’s risk for falls. In most cases, a hoarder’s home is always found to be fire and health hazard. If nothing is done to address the issue, hoarding can make healthy functioning impossible on a daily basis. Hoarding disorder is linked with alcohol dependence, schizotypal personality disorder and paranoia. Those who have pre-existing Obsessive-Compulsive Disorder also face higher risk for hoarding. Those who suffer from excessive physical discipline before the age of 16 are also more likely to develop hoarding behavior in adulthood. Help the senior acknowledge the issue. The biggest obstacle in addressing the hoarding issue is admitting that there is a problem in the first place. When a person denies the hoarding problem, it will not make things disappear. The problem may only get worse. The key here is to be open, frank, and honest. As a caregiver or adult child, tell the senior person about the problem and solve the issue together. The senior may not be aware or he may deny the existence of a hoarding problem. Some seniors are also not aware about the potential dangers of hoarding old stuff. The awareness can get the senior realize and help solve the problem in the process. It is best to plan out how to tell the senior about the problem. The hoarding behavior may be a sign of mental illness. It is best to consult a therapist to see whether there is a problem. As an adult child of the senior, there should be a concern regarding the attitude and approach of the senior towards the hoarding issue. Hoarding stuff is not normal at any age. The senior may be having stress and anxiety issues that remain undetected. With proper intervention, one can put a lid on the senior’s hoarding habits. You can also contact a hoarding intervention specialist. These are people who have gained expertise in helping people with hoarding behaviors. They can help an elderly change his perception to his accumulated stuff. They do this so that seniors find joy and fulfillment not in the acquisition of material things. With the help of a hoarding specialist, seniors are able to overcome the underlying cause of their hoarding behavior. If the underlying cause or reason is not properly dealt with, the hoarding behavior will only be repeated. The result would be frustration and hopelessness, instead of regaining a normal life. Hoarding is a sensitive matter. Approach is everything. It is not just a physical issue, but it may be a mental or behavioral issue as well. This is the reason why professional help must be sought. They can help address underlying problems and find a permanent solution to the problem. The clutter should be addressed quickly. Otherwise, it may lead to several health hazards. There are communities that can help with the hoarding issues among seniors. A special hoarding cleaning company can help get rid of the stuff that accumulated over the years. There is a need to address the mess and to eliminate the stuff properly in the most sanitary way. Not all cleaning companies are able to clean out such kind of clutter. This is the reason one needs to talk to a special cleaning company about the situation. There could be cleaning companies that can also get rid not just of the clutter. They also have specialised equipment and chemicals that can remove pathogens accumulated over the years. It is best to hire a company that can provide total cleaning through effective and discreet service. Hoarding situations can be cleaned out. It is something that can be addressed properly, with the proper guidance. Make sure the disposal is safe and sanitary. This way the problem will not become worse than it is. Research is an essential piece of action for caregivers and adult children. As an adult child or caregiver, it helps to do some research on how to approach the problem. There are tons of studies online about senior hoarding. If a person develops a better understanding on the hoarding behavior, it will help him how to approach the problem. Doing research will help caregivers and family members better understand the problem. Hoarding is a serious problem. The caregiver or the adult child should be aware about this. Researching about the problem may help in solving it without causing further stress to the senior. Addressing the problem with the right approach can go a long way towards resolving the issue sooner than expected. More and more experts are now looking at Hoarding Disorder as a unique mental health disorder. To date, more research is being conducted to be able to find the best treatment for this condition. The use of medications have been proven effective in about two-thirds of people who have this condition. These are the same medications used for treating Obsessive-Compulsive Disorder. Two CBT techniques that were found to show promising results among seniors are Cognitive Rehabilitation and Exposure Therapy. These techniques help seniors power up their decision-making skills. Their ability to plan and solve problems are also improved using these techniques. It is also through CBT that their unrealistic fears of tossing things out are being challenged.